Poetry and Life – Two wonderful topics! Today I decided to grab a cup of coffee and take the Sunday paper and read it in my bed. This is a huge treat for me. I love my bed. It is new and has white crisp linens and a very special quilt from my Grandmother Hallie folded at the end. I only spend time to sleep in my bed usually. Those hours have slowly become 9:30pm to 5:30am. So at 8:30 on a Sunday morning snuggling back in under my quilt is a treat like Christmas morning to me. Now, we still have the newspaper delivered in our driveway. Yes, it is rolled up put in a plastic bag and thrown from a car by a human every morning around 6:00am. I describe this at length because I know we are one of a dying breed. Yes, it is bad for the environment to have a huge pile of papers to recycle every week, it does sort of pad the wine bottles as we push the trash down the driveway. It is wasteful and fills the recycling bin. I do use the plastic bags for my doggy business receptacles. But I am convinced my time holding the paper, reading the paper and cherishing the information adds true value to my life. I must add it is a constant budget discussion with my husband. He is convinced it is one more small monthly charge we could eliminate. Having computers should make our lives able to read all papers at the touch of a button. I stand my ground and explain – it keeps us aware of what is happening and gives our eyes a break from the computer screen. It inspires me in ways I have no idea and brings topics into my life that are moving. And today was one of those days! The sad story of an old Austin restaurant closing after 30 years of business. The back story of the owner and her journey of owning the special restaurant and what it did for Austin over the years. And below that article a beautiful photo of a poet speaking at a Women’s Conference. 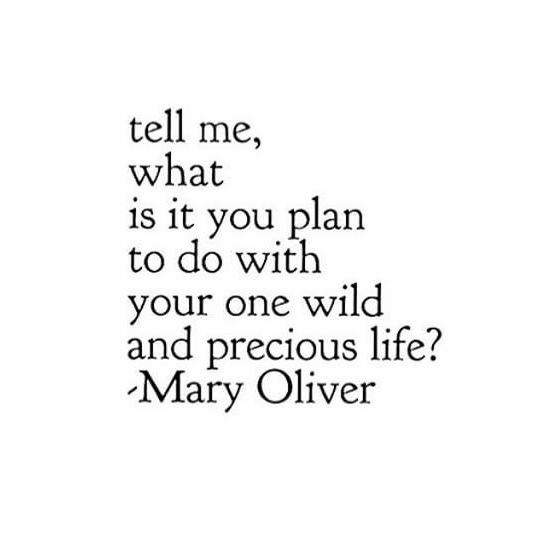 Mary Oliver, a famous poet. She died at age 83. Maggie Smith wrote a beautiful article celebrating the poetry and life of Mary. Maggie writes for the Washington Post and she grew up in Ohio, just like Mary did. Mary Oliver won a Pulitzer Prize for her poetry in 1984. Well, all of this is so interesting to me. In 1984 I was not paying attention to poetry or Mary Oliver. I was a coed at Florida State University hanging out with my sorority sisters and worried about what aerobics class we would attend each day. I had no clue who was winning the Pulitzer Prize that year. Poetry is powerful. This one line is a question I want to ask my children, my friends and myself. Over and over. Thank you Mary for sharing your words and your wonderful life!